Obtainium Cup Contraptors Rally this Sunday! 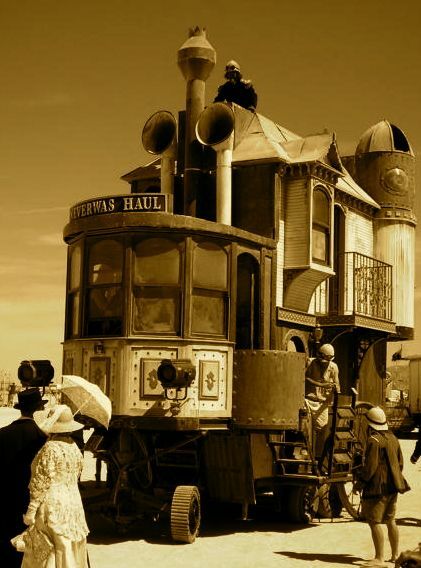 this Sunday Obtainium Works, makers of The Neverwas Haul art car, is hosting the 2nd Annual Obtainium Cup Contraptors Rally on Mare Island in Vallejo. any item, found or obtained for free. Materials used to create art work such as assemblage, mixed media or sculpture that wasn’t bought new, but obtained in other ways, such as second-hand, dumpster diving, chance findings or donations. 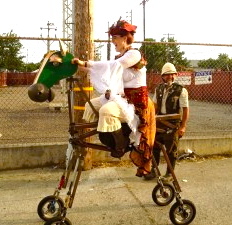 The Obtainium Cup Contraptor’s Rally is a human-powered sculptural vehicle rally and festival on historic Mare Island in Vallejo, California on Sunday, July 21, 2013 from 3pm – 9pm. Inspired by the Kinetic Grand Championship in Arcata, CA which has been happening since the late 1960’s and draws thousands of viewers to the area over the 3-day event, the Obtainium Cup is a one-day event and will begin at the Coal Sheds Studios at the waterfront of Mare Island. Each hand-made rolling sculpture will run the course and avoid attacks from flying monkeys, zombies and Mad Hatters. This is a great time to preview Burning Man art cars, connect with the local Burner community and get steamed up. This happens only once a year, so don’t miss this family-friendly event!